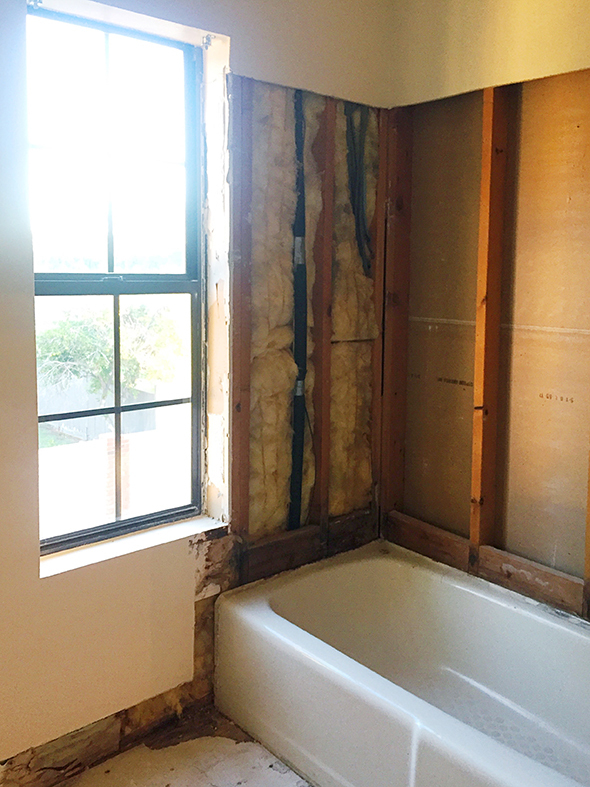 We pulled out everything – all the old brick veneer floor tile and the beigey almond tub surround as well as the old vanity and the pony wall the didn’t actually offer up any privacy and only managed to make the room feel smaller (bye!). Our plumber had a place to reuse our old cast iron tub so he’ll pull it out when he comes next week to do all the valve work. IT IS SO HEAVY. 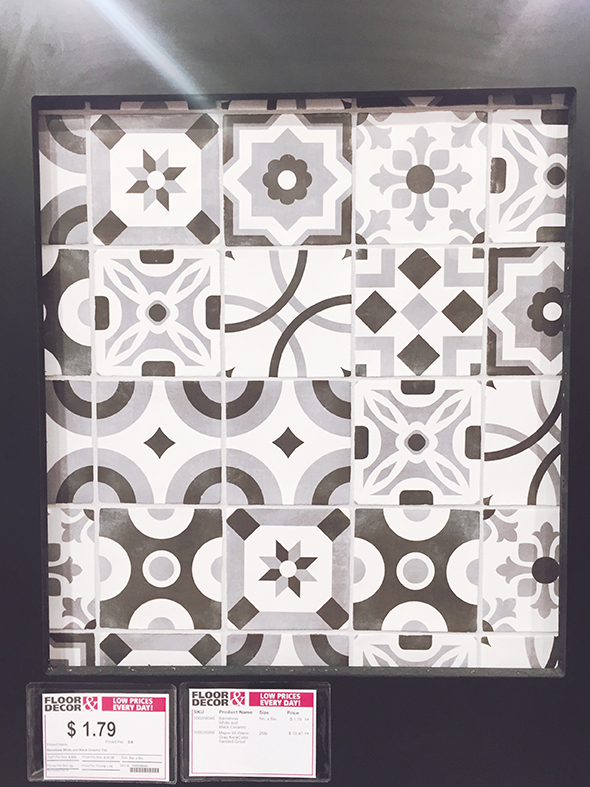 Here are some of the tiles I was loving at Floor & Decor last week. 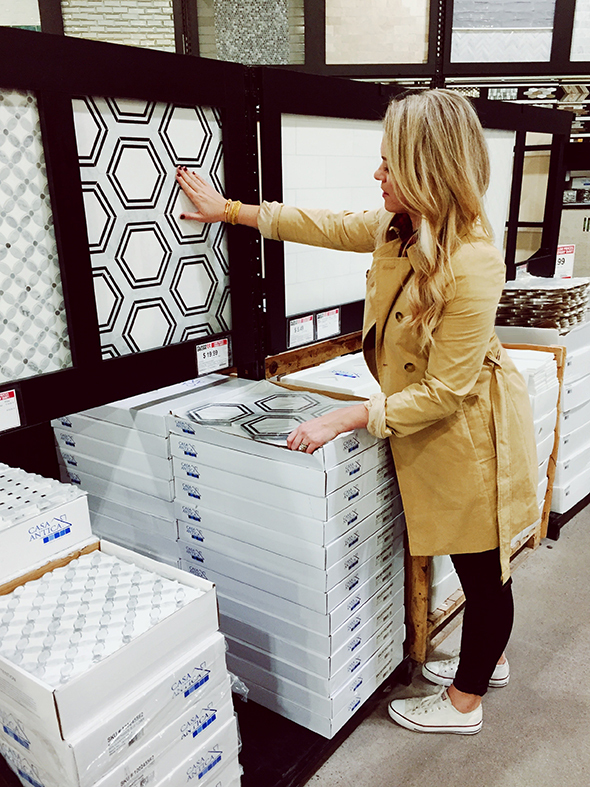 I found a ton of favorites I’ll be pinning for our kitchen and master bath remodel later this year! 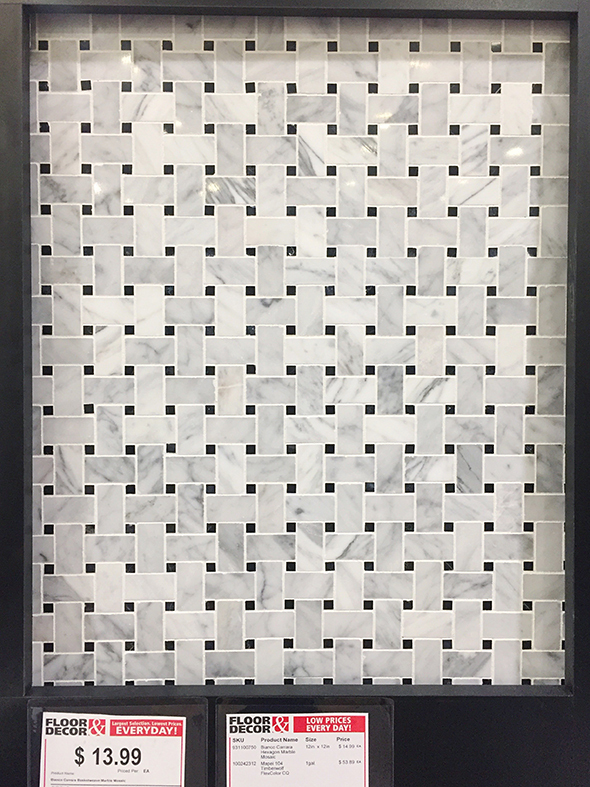 Under $2/piece is a pretty unheard of price for graphic patterned tile! I love the one with the little star and the four diamonds the best. 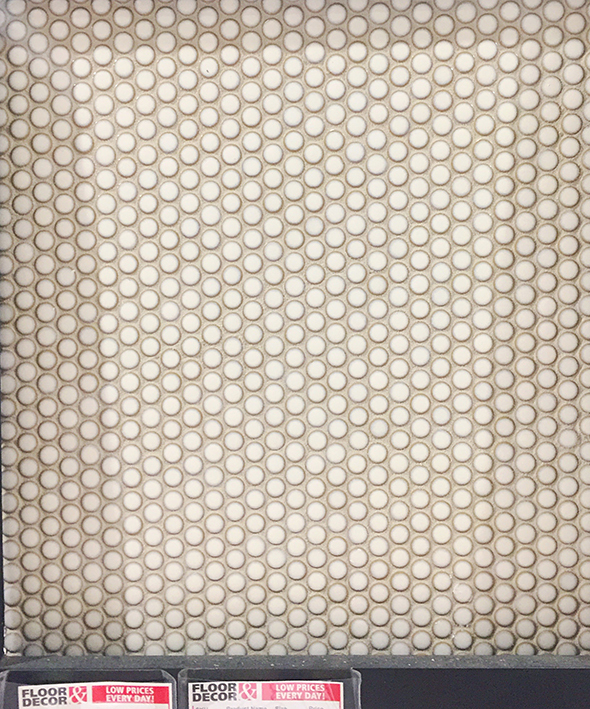 They also have a couple new lines of that really popular handmade, irregular look tile in really soft and subtle colors. I’m thinking of one of these for our kitchen or laundry backsplash. So pretty and soft! Maybe with my favorite black slate floors??? SO PRETTY. 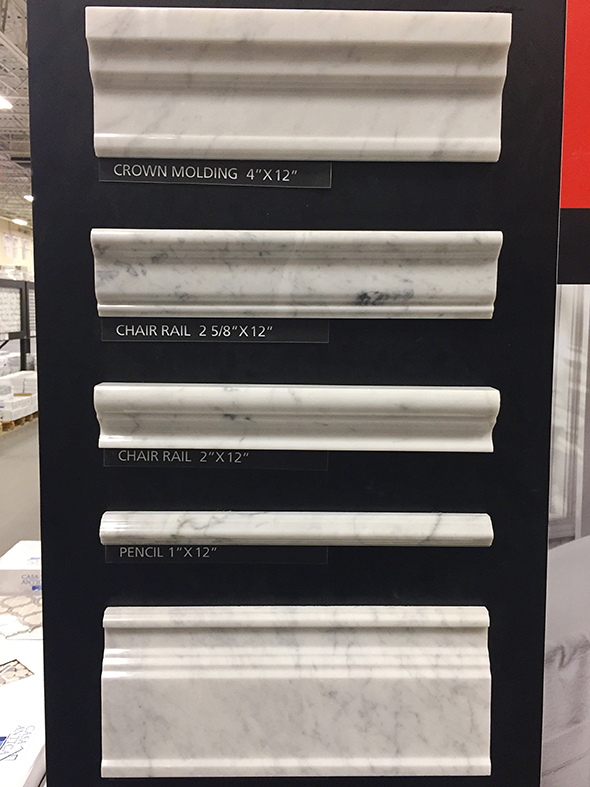 There were some really gorgeous new marble options that I’m considering for our master bath. I’m obsessed with this brand new hex pattern! 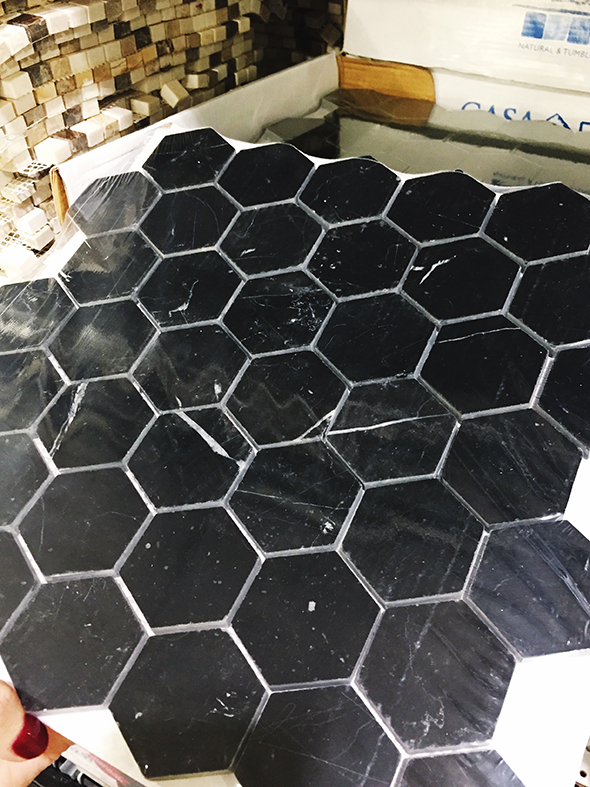 But I also really liked this simple black marble hex. 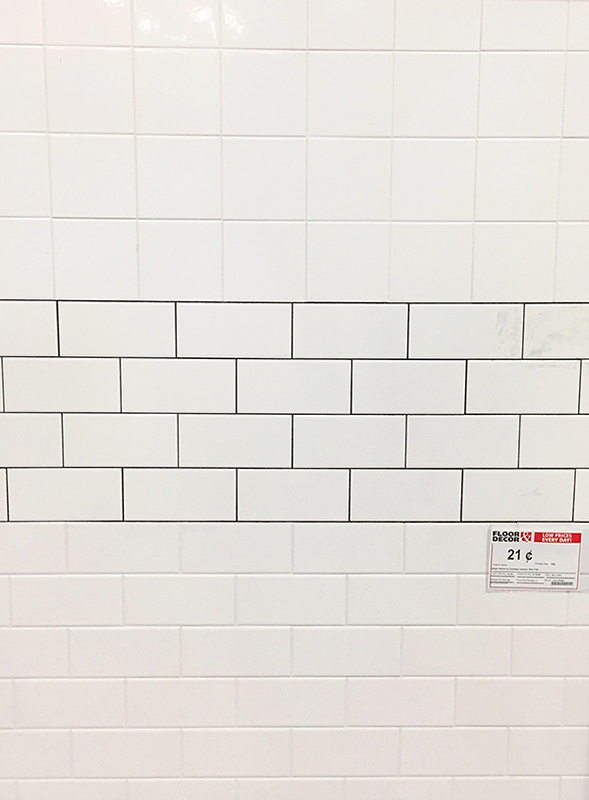 Could be really great with a dark grout and then light or white everything else. 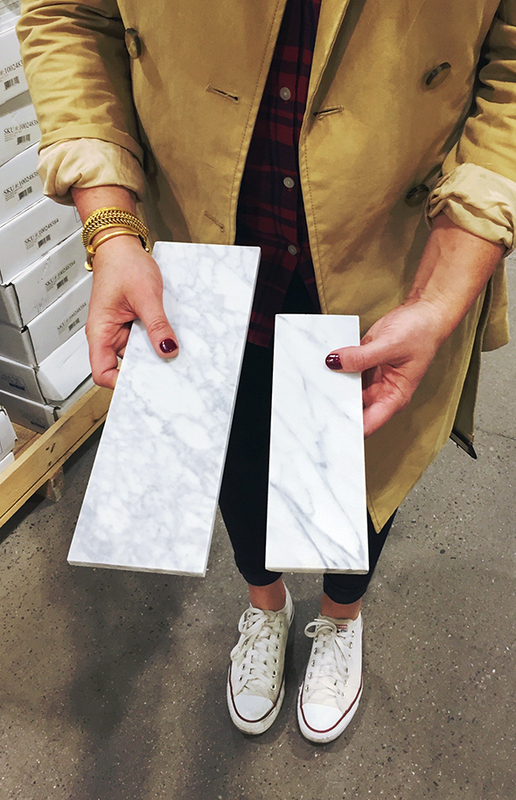 Or paired with this new, super veiny honed marble subway would be so, so good! I love that they sell the prettiest marble caps and base pieces too! 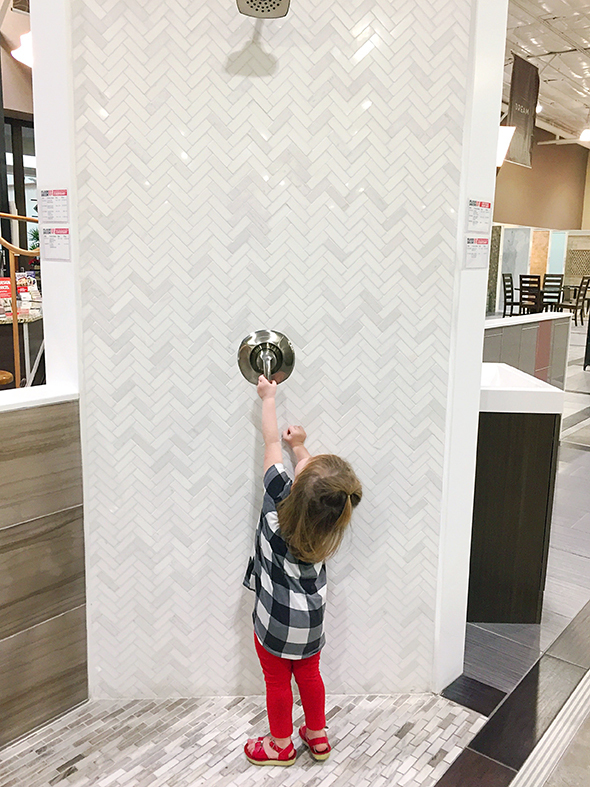 Margot’s vote was this white marble herringbone pattern. I love the subtle variation in color here. There were SO many beautiful options for our other projects that I was having a hard time focusing on what I needed for the girls bathroom. (Also was distracted because I was shopping with four banshees.) 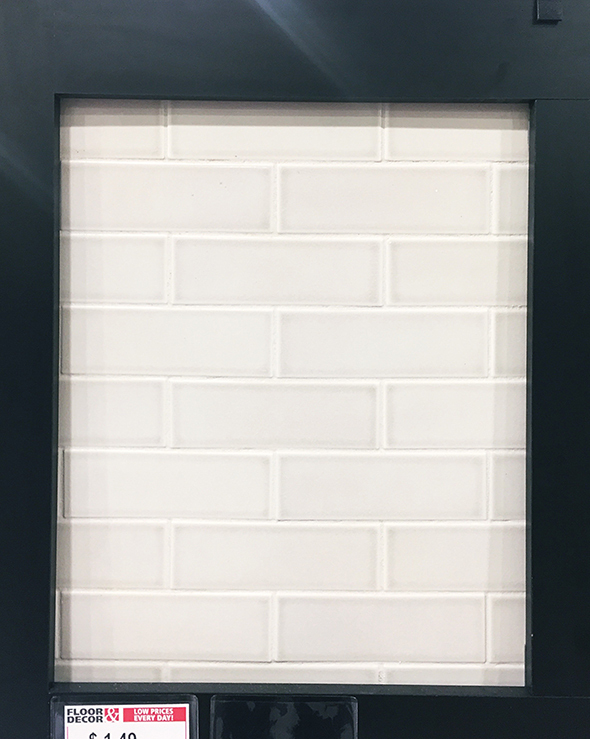 We wanted something really inexpensive and easy to maintain, so of course subway tile was one of the first things that came to my mind. I like this turned herringbone pattern they had on display! 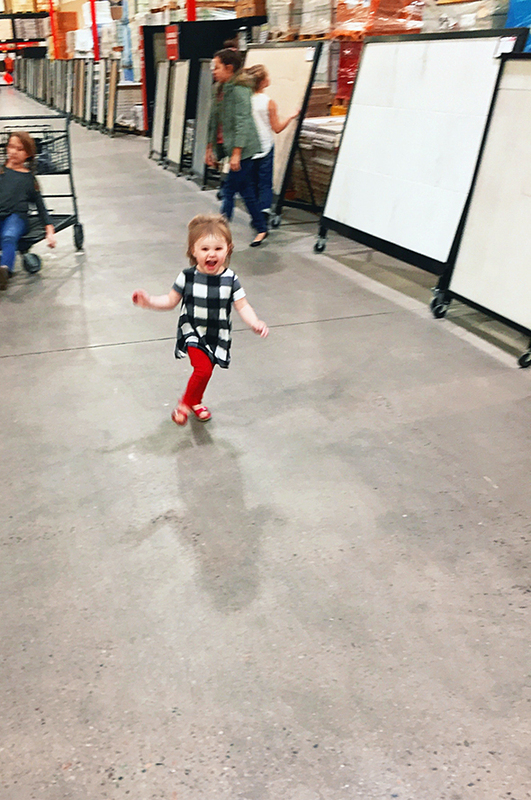 What I really love about Floor & Decor’s subway tile (beside the fact it costs only 21 cents per tile!) is that it is the brightest, cleanest shade of white out there. It’s not off-white or ivory like the hardware store subway. 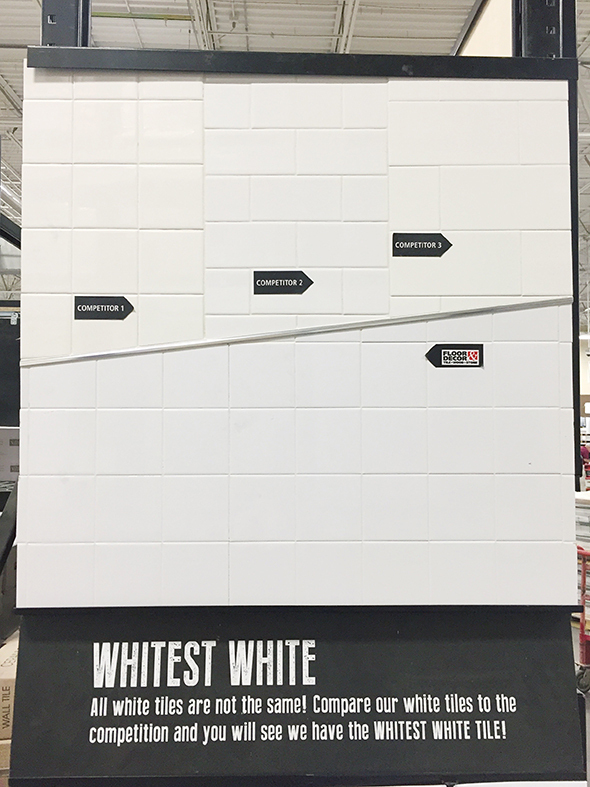 I’m kind of thinking we’d like to go with a medium gray grout, like #47 Charcoal in the chart below. I was pretty open on the floor tile options. 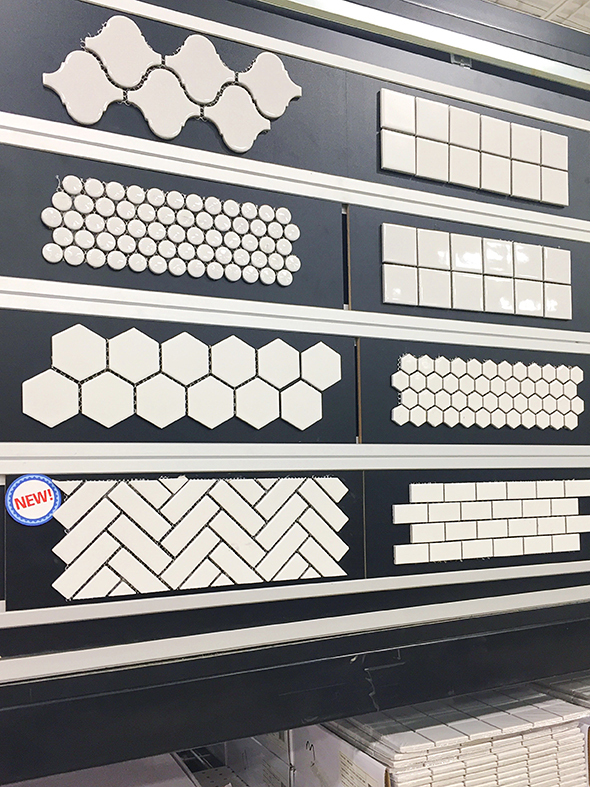 The girls and I stood in front of these boards of small scale ceramic tile for a few minutes and talked about the pros and cons of each tile. They LOVE giving me design input and all say they want to work for me when they are older. :) Those little cuties might be crazy, but they have every part of my heart. We thought a lot about penny tile at first. I love this all white version. I was also really drawn to this more mottled version where the glaze doesn’t cover the sides of the penny tiles. It feels softer and more organic to me. 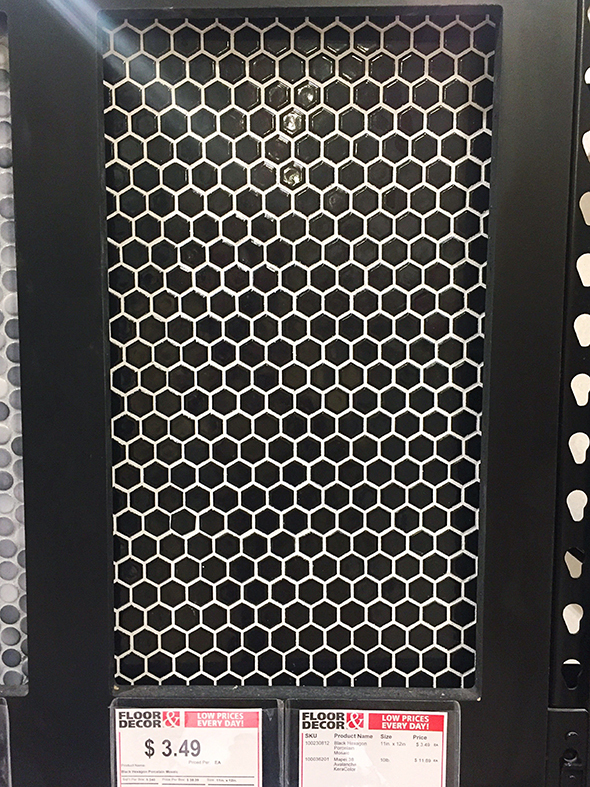 Floor & Decor also has a ton of hex-shaped ceramic tile options like this all-black (which looks amazing with the white grout!) and this matte gray tile. 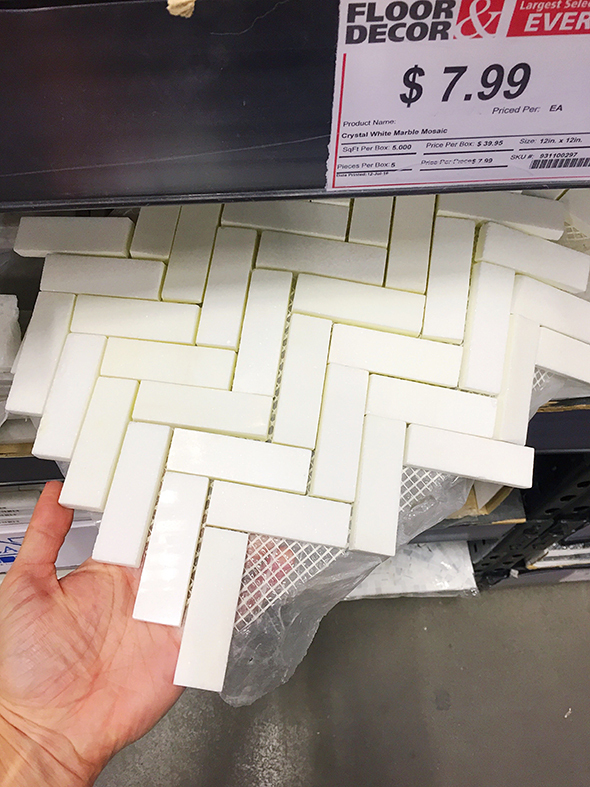 But this brand new white ceramic herringbone tile called out to us! 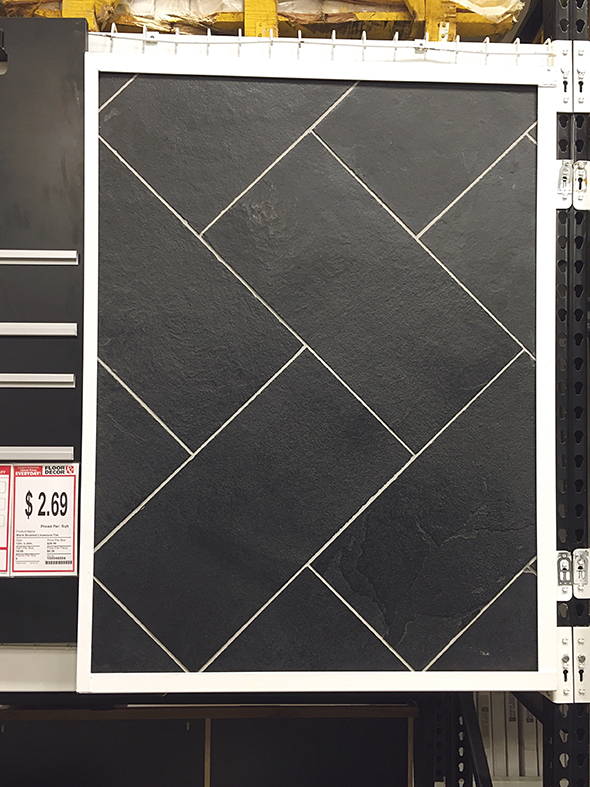 It’s only $2.99/ft and I think it would look GREAT with that same charcoal grout. The whites of the two tiles pair together nicely too. I think it’s totally fine to mix shades of whites in a bathroom (all the exact same color would read a little flat I think) but extreme differences in shades can be REALLY bad and suddenly you might have floor tile that looks yellow or a tub that looks gray. Not a great look, so just be mindful when you’re mixing lines of tile! I think the subway and herringbone colors are a great mix! 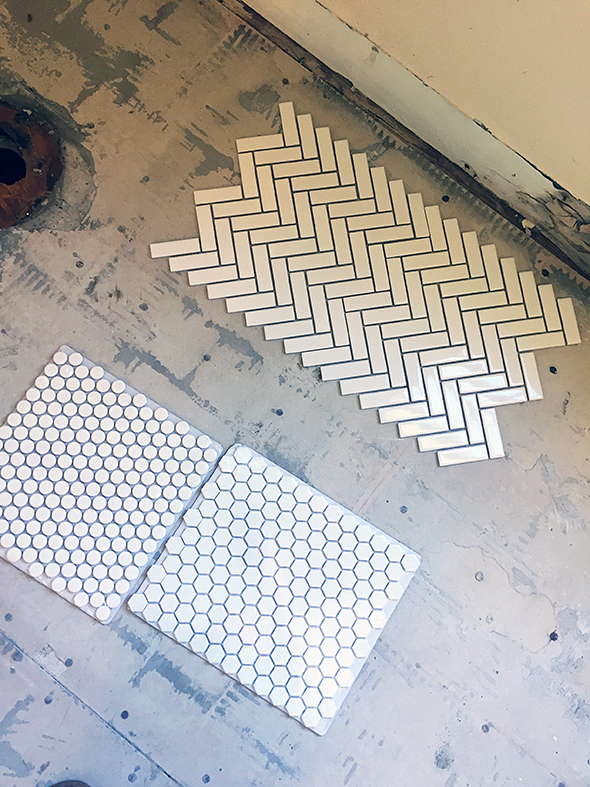 We brought a sheet of white hex and penny tile home too, but when we put the samples in the bathroom on the floor, the girls and I agreed the herringbone was the clear winner! 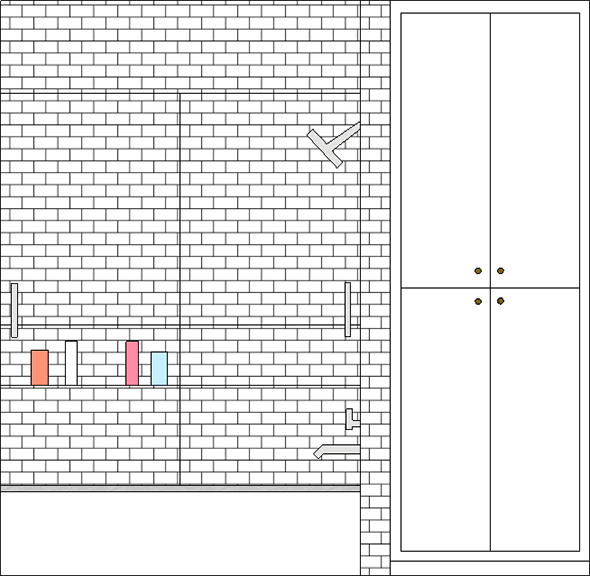 Here are a couple of (very quick) sketches of what we’re planning for the bathroom. We’re going for clean and bright with lots of white and lots of texture from the shapes and patterns in the space. I think it will be pretty! This week all the plumbing and lighting arrived as well as the vanity, so now that the tile is selected, it’s full steam ahead! 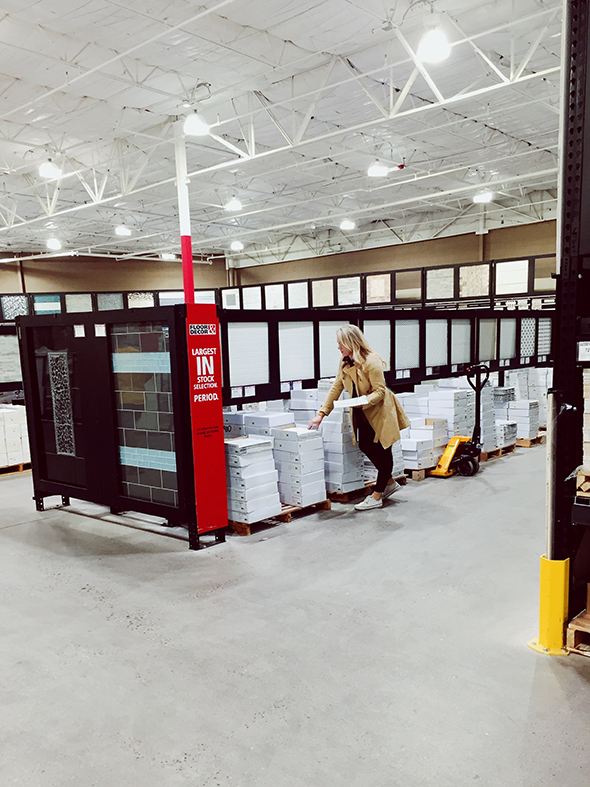 This post was a part of an on-going collaboration with my genuine favorite source for tile, Floor & Decor! All opinions are my own. Thank you for your support of our sponsors! It will be lovely. What lucky girls! Love it!! And I love the walk-through of all your options- so very helpful! Fabulous post. I need to go to Floor and Decor to check out your choices in person. Thank you for sharing. Peace and joy! troducing me to Floor and Decor, love their selections. I was able to locate a store not too far away. Looks like a great source! 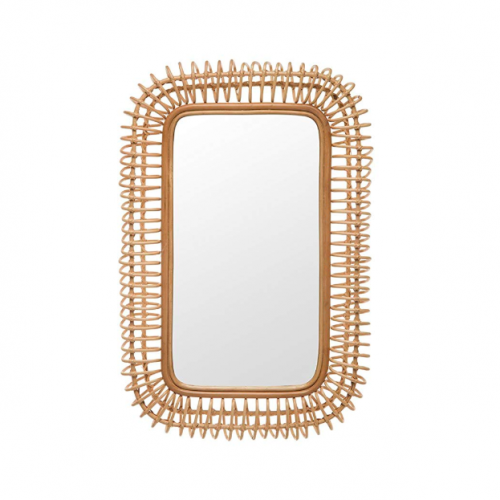 Desperate to find a vanity just like this. Please share where it’s from! Thanks so much. And it will all be beautiful. We are about to redo 2 of our bathrooms. I like the tile rec, but need a local plumber referral. Can you email me who you are using. Only if you like them – lol. Thanks! I use Larson Family Plumbing a lot. They are fast and clean and really good! I think the matte gray tile would be SO cute in a little boys bath and would hold up to mess really well! Ha! Thanks for the tip! :) Sometimes form over function, right? I love having you as a resource for when it is time to buy again. 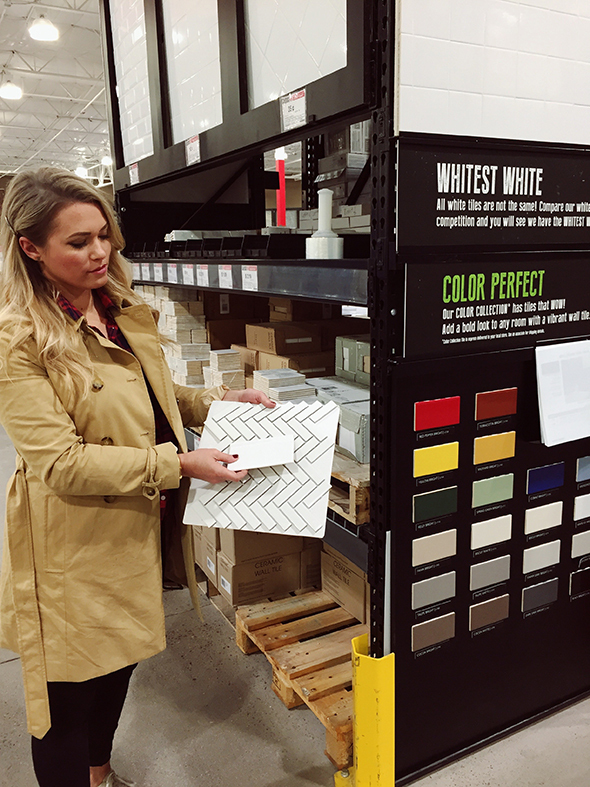 I am hoping to find “the perfect” white post- because we will probably go all white in our house. But these TILE PRICES!! I wish I knew about this place when we bought tile to redo our bath up in lakeside! Hopefully I can find a deal in California – because all we can afford will be a fixer upper. At least I will know where to go when we move back to AZ and fix up a place. It was so good seeing you the other night. It has been YEARS. We may make it to Steve’s party tonight. Maybe. I wish there was a Floor & Decor near me! The closest one is a three-hour drive. 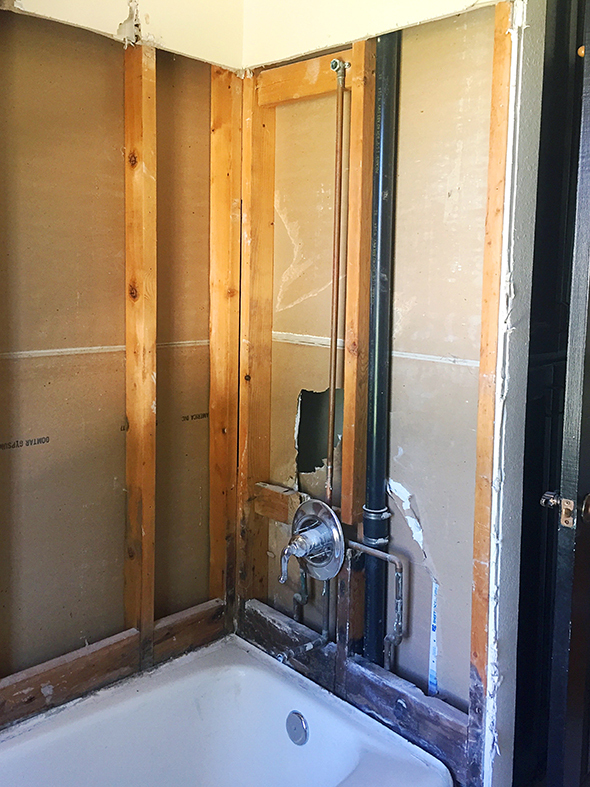 :( We are just finishing our third bathroom this year; I’m ready for it to be over! 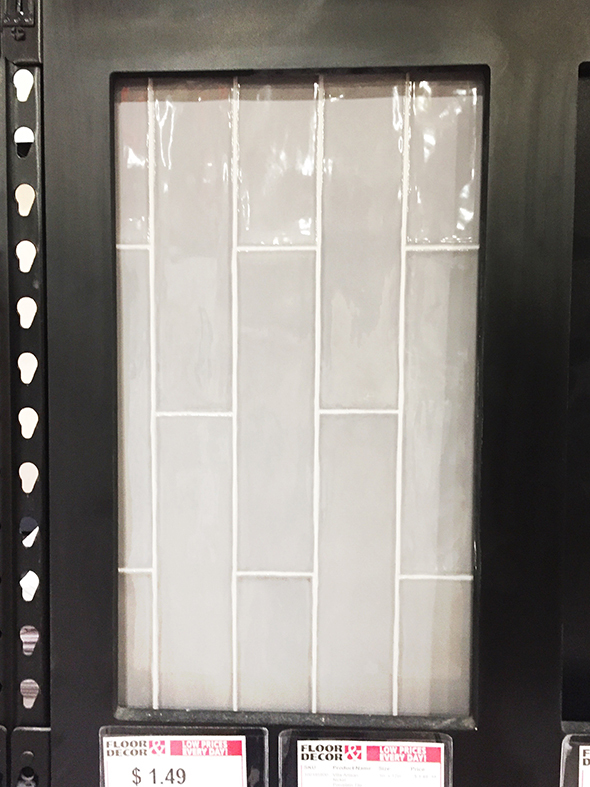 The first two have matte black penny tile flooring with black grout, and the third has 2-inch matte black hex tile with black grout. I love this look so much! 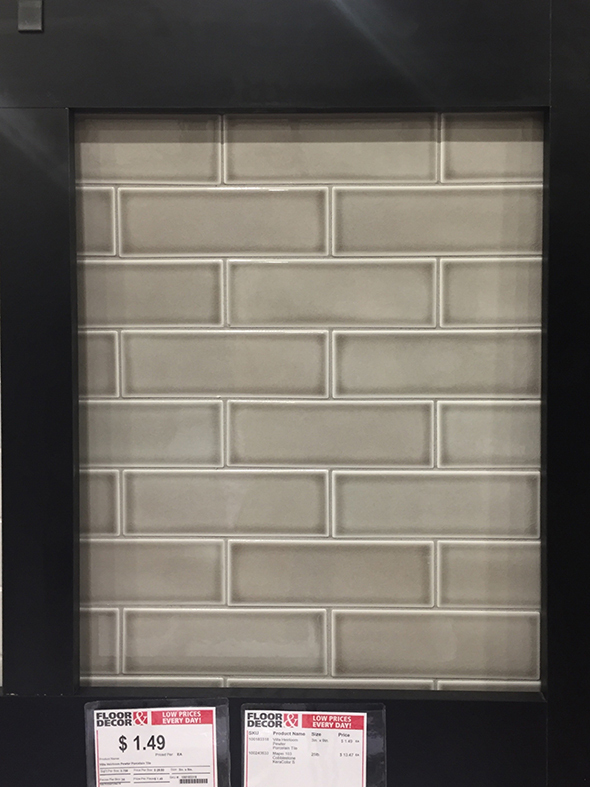 The walls are subway tile in different patterns–running bond, herringbone and crosshatch. I went with dove gray grout with the white subway tile. I’m bringing in color with the accents. I’m eager to see how this turns out. Sounds beautiful, Aidel! :) Happy New Year! 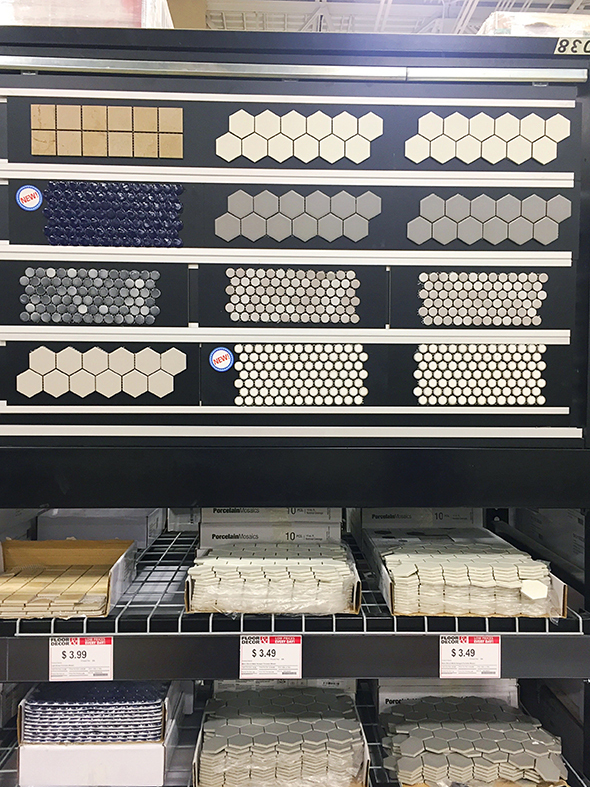 Okay, just finished a tile project and bought tile from a hardware store- which I thought I was getting a great deal! Um, last time for that ever. I had no idea it was so affordable and so fab looking! I don’t care if we have to drive an hour, we are hitting up F&D for our next project! Thanks for the inspo Jenny! You’ll love Floor & Decor! The selection is crazy good! :) Thanks for stopping by! Love that you showed some of the great options out there. I love what you picked. 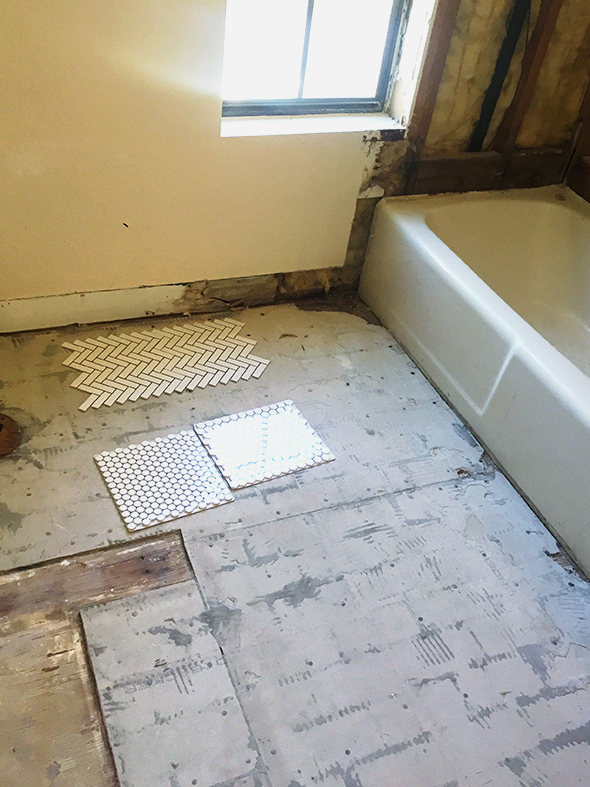 I just have a quick question about the grout. 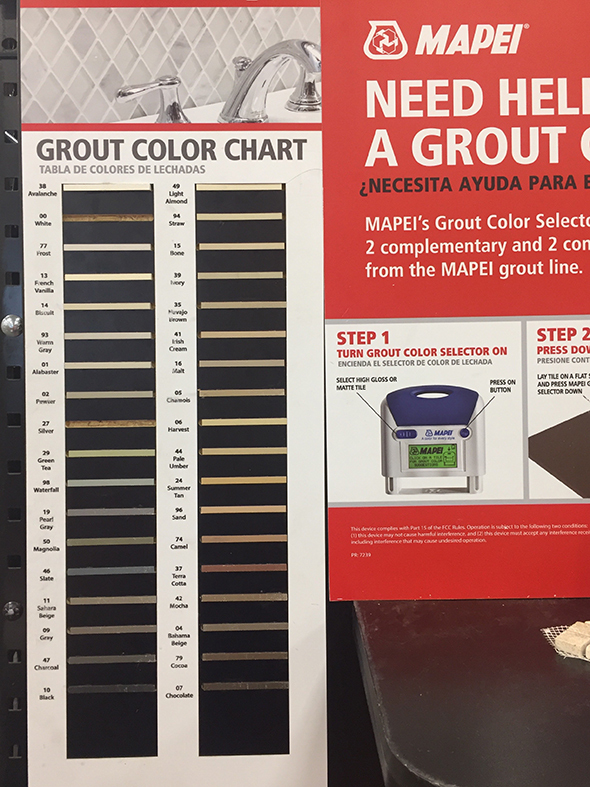 Is there a rule of thumb that you have to use the same grout color on the floors as you do the walls, or is it ok to used different colors? 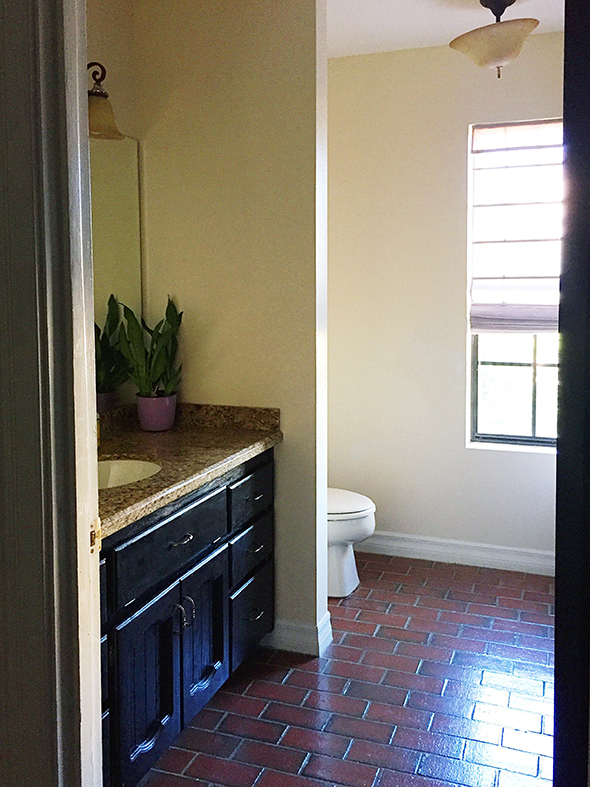 I have a small bathroom that I am wanting to update, and I’m unsure if it will look too busy to use the same darker grout on the walls that I’m planning to use on the floor. Would love to hear your thoughts on this. I am looking forward to following your progress on your project! I think it’s nice to use the same grout color on the floor and walls! Where did you get the vanity? I would like one like it. It’s from a company called Avanity I think? I bought it on Bellacor and will post a link later when I get back to my computer or in the follow up post for sure! Honestly, the floor tile looks dingy against that bright white subway to me. I think having it full scale will amplify the effect, and I am not sure “dingy” is a desired bathroom look. Perhaps reconsider the dark hex? Good luck! Dawn, it might also be your computer, because on my screen they both look sparkling white and lovely. Jenny, we are in a rental that is brown on brown on brown and I’m living vicariously through all of this bright white tile! Also, I tell everyone about Floor & Decor bc of these posts. AND, thanks for the source about the vanity! You have a great nose for value. Huzzah! 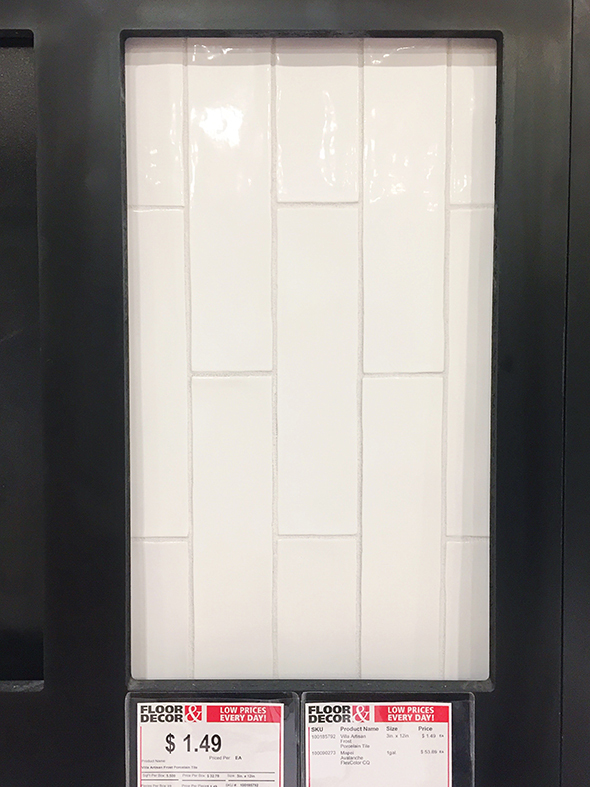 Perfect timing!We are in the middle of our kitchen remodel and I needed a unique white subway tile to go with our leathered black granite Grabbed those longer villa tiles in frost and they are going in today! can’t wait to see the progress! 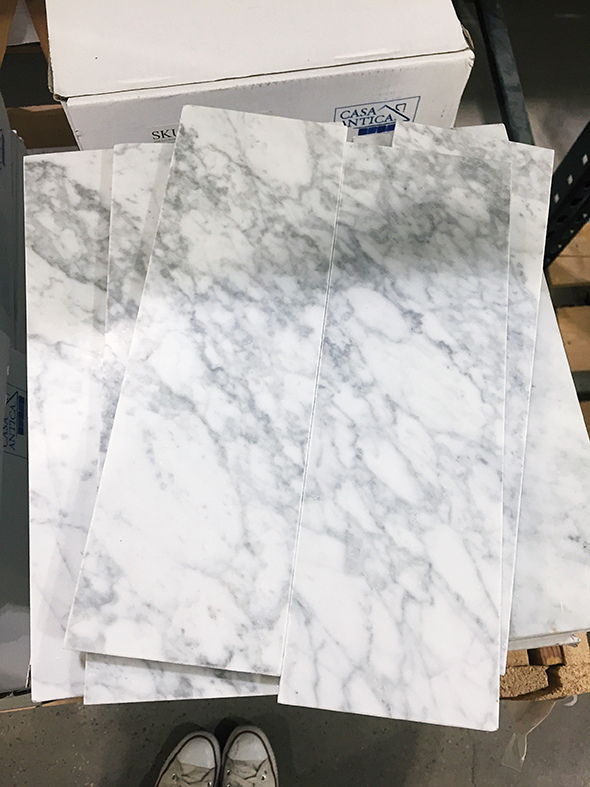 i see you suggesting several marble options – any cleaning tips? do you re-seal periodically? we have a family bathroom (joy of old DC house!) and it’s marble EVERYWHERE. it’s so hard to find a good marble cleaner for the shower that actually gets rid of mildew. any and all tips appreciated! Do you have have a link to the hex pattern? Have been looking for something just like this! 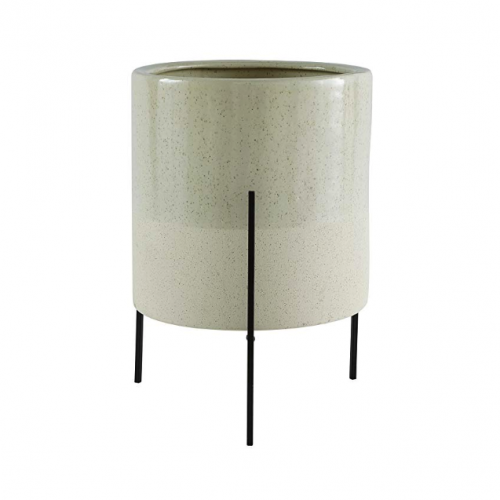 The one you said you were considering for your master – marble, black and white large hex. Thank you so much! Yes! 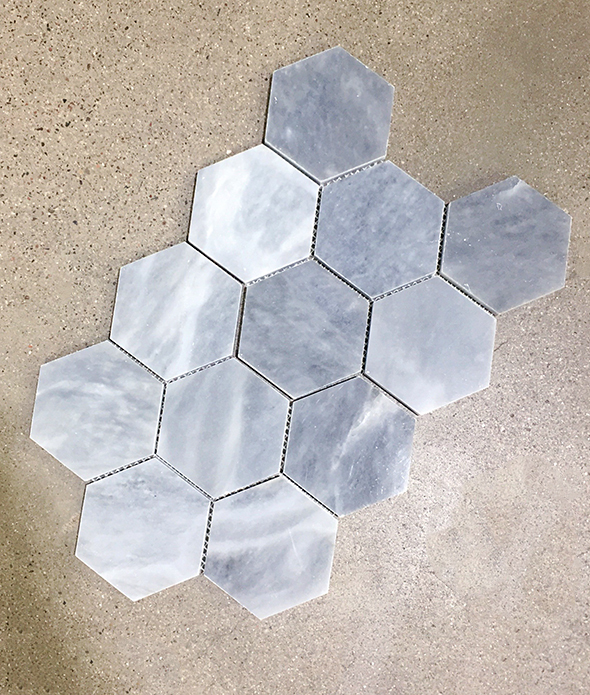 am looking for the hex marble tile as well. 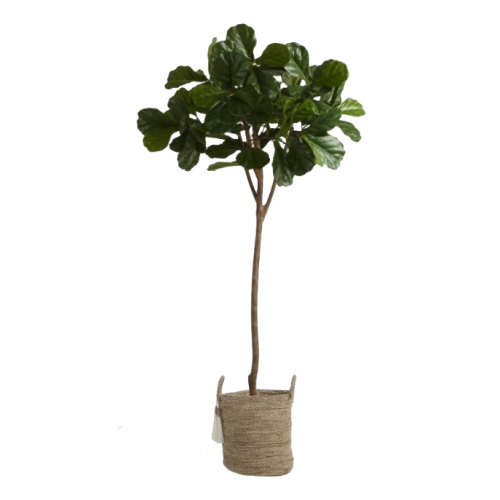 I can’t seem to find on Floor & Decor website. They just posted the listing! This post is so inspiring! My husband and I just purchased our first home (we move at the end of January!) and the bathroom is functional, but straight out of 197o-something: faux wood walls (there may be something fun behind them?! ), avocado (and not the good kind of avocado) tub, weird vinyl flooring, barely lit… we won’t have money to renovate straight away, but it’s fun to file away ideas for when we do. Cheers! Sounds like it can only be up from here, Mindi! :) Best of luck with your projects!! I tried to enlarge it but still couldn’t make out the product number or description of the encaustic tiles, I want to make sure they have them in stock before I drive all the way out there and every search term I use doesn’t pull anything up. A product number would be helpful or even the description could work. I think it is ceramic tile made to look like cement tiles. It looks like the pattern name is Barcelona White and Black. Hope that helps! 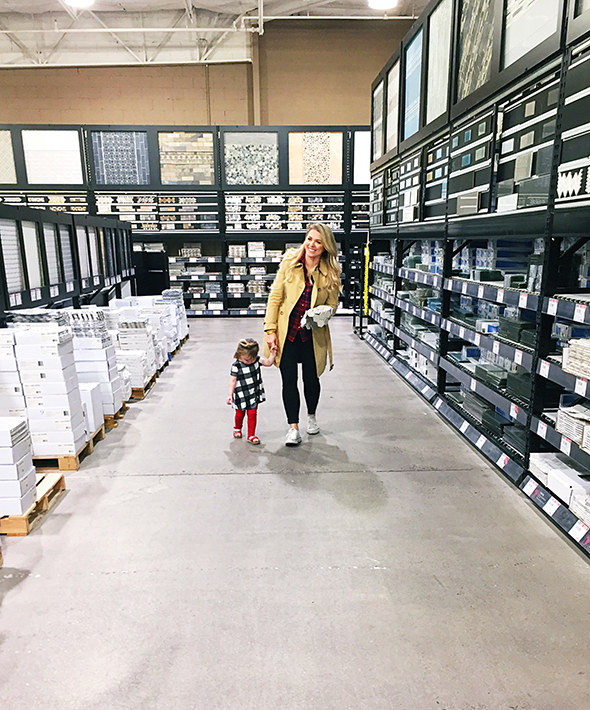 This post totally has me wanting to put the rush on selling our house and starting our next remodeling project! 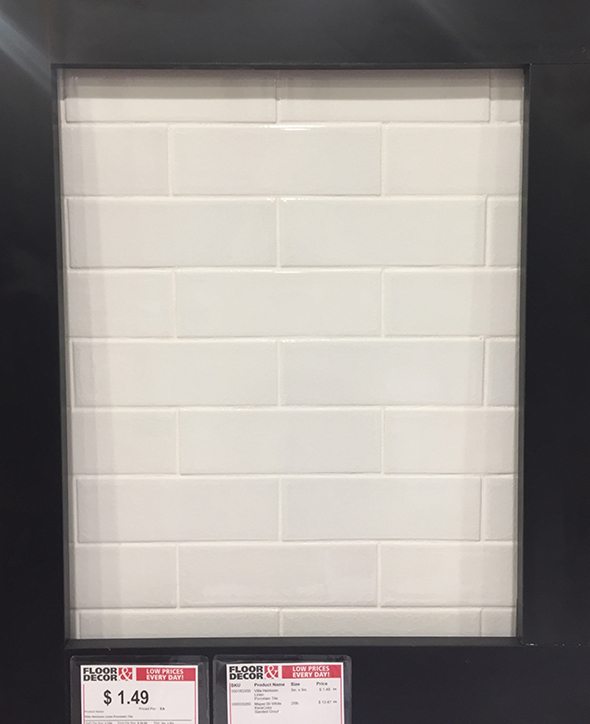 We did the subway tile with grey grout for our current home and I love it. It’s a classic! Floor and Decor is already so awesomely distracting. I admire you for getting so much done with your tiny design crew in tow! Hil! I’m working on a small bathroom, and I think you just helped me make a breakthrough! 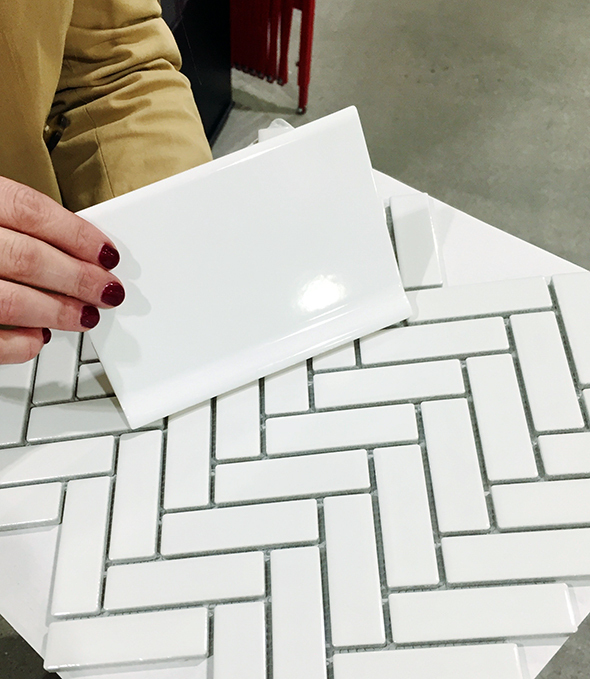 Do you mind if I ask: Is the herringbone floor tile matte or gloss? Thank you for your help! I’m going down this weekend to check it out. Please show us how it turned out in your space when you can! So exciting! 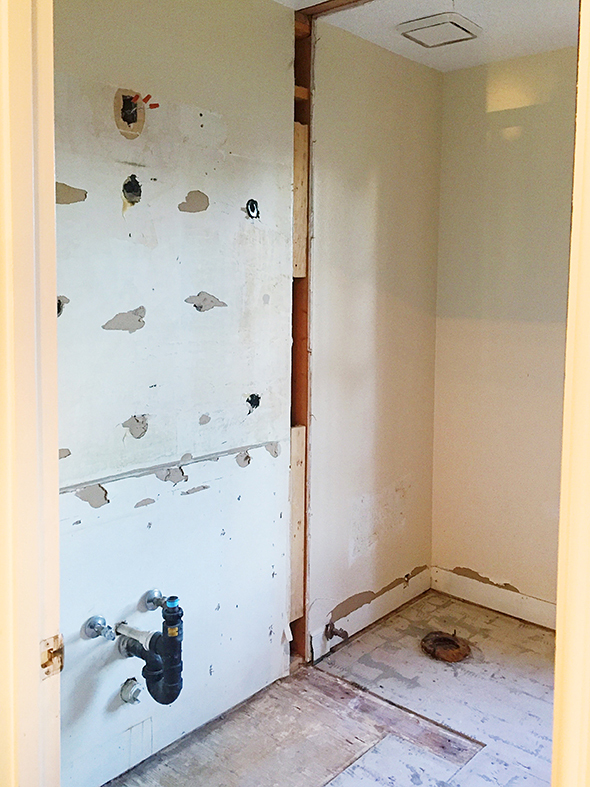 Can’t wait to see the finished bathroom, you always mix and match so well. So many good options! That herringbone pattern is pretty great. Can’t wait to see how it all looks when it’s done! 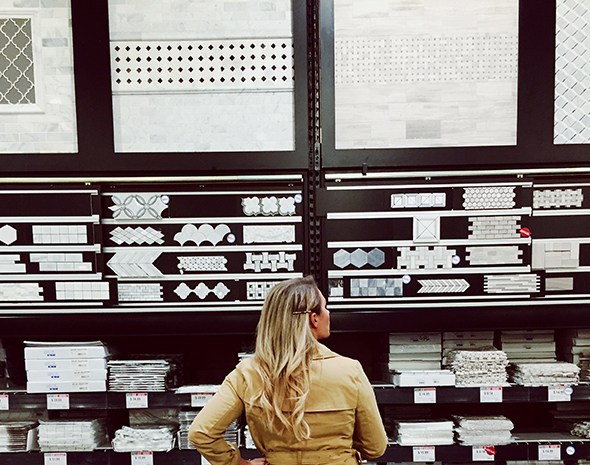 They say imitation is the finest form of flattery… and I will (absolutely, definitely, without a doubt) be at Nashville’s Floor & Decor first thing in the morning to look through the marble options for our guest bathroom! Your little ones are the epitome of adorable. So, so sweet. They are going to love their lovely new bathroom!! Do you have a link for the hex you menationed for your master? 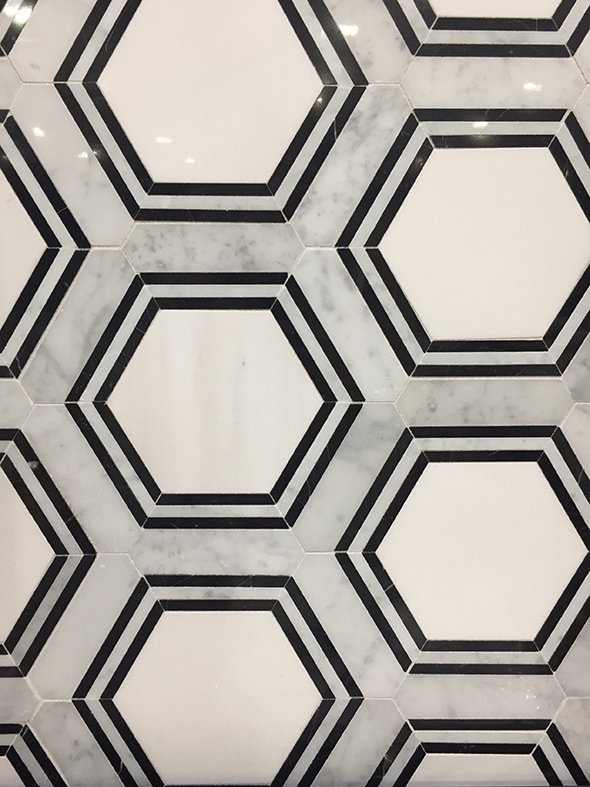 The white, black and marble large hex. Thanks! Much appreciated!! Thank you so much! Really appreciate it. Am in the midst of building a house and want to use in one of our bathrooms :) Love all your selections. Everything looks beautiful! Good news, Sarah! 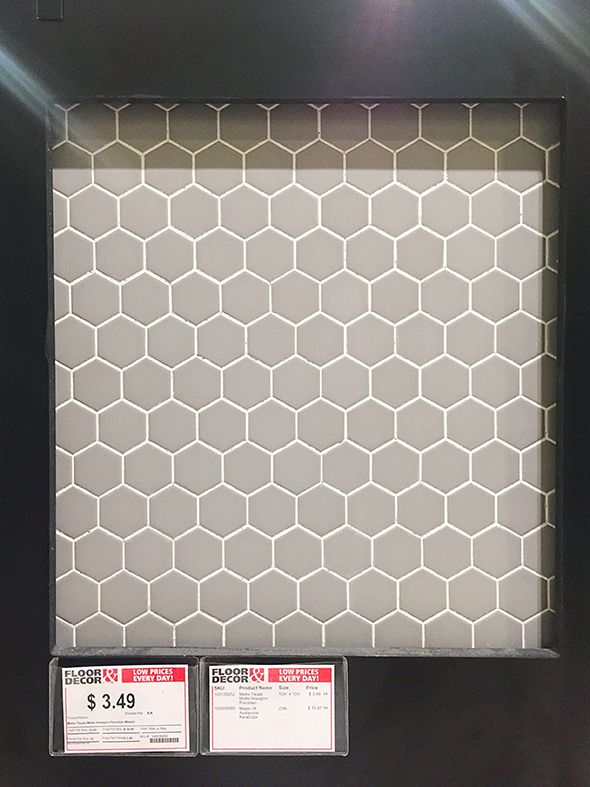 The Hex tile has been listed! Hi Jenny, totally unrelated, but do you have anyone you can suggest in the Phoenix area for custom drapes/window coverings? Thanks in advance! Can’t wait to see how the bathroom unfolds! Floor & Decor rocks my world. 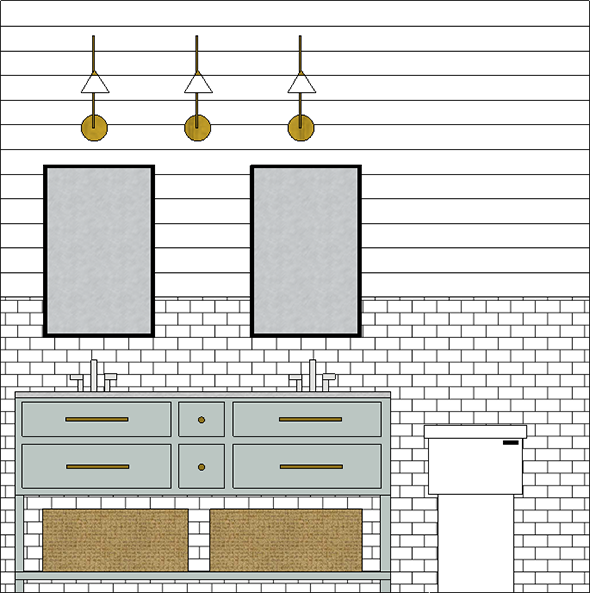 I love your plans for the new bathroom and always so excited to see more of your design. 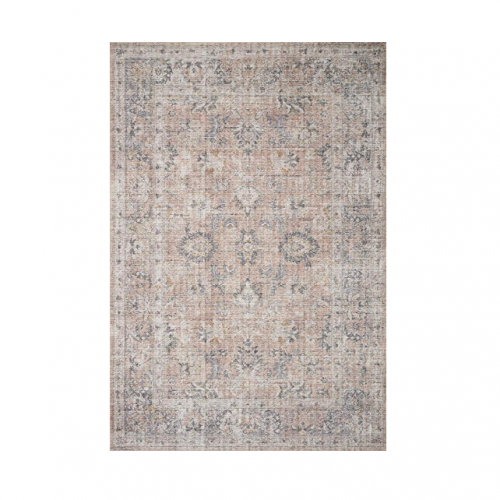 But I wanted to share with you that per your Floor and Decor recommendation, my husband drove quite a way from our home in Los Angeles to the nearest location in Downey, CA and the selection was appallingly bad. We were on a tight schedule and had looked locally and found some passable options. (Just looking for small white tiles, much like in your post). They had nothing. Our Home Depot had a better selection. I would think twice about recommending them as a company. It definitely set us back on a time-sensitive project trying to follow your recommendation. Hi Alexis! I’m SO sorry to hear about your experience and I will definitely pass along your comment to my contacts there. We have several locations in AZ and all of them are really great! I know other readers in other parts of the country use and love their stores too so maybe this is a California-specific issue? I’ll ask! Very exciting! 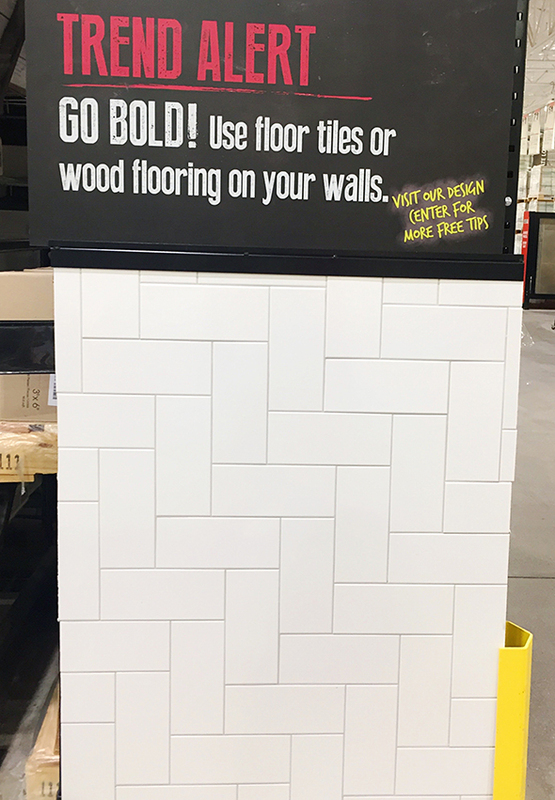 What a fun tile store. I live in Scottsdale, and I love Floor and Decor! 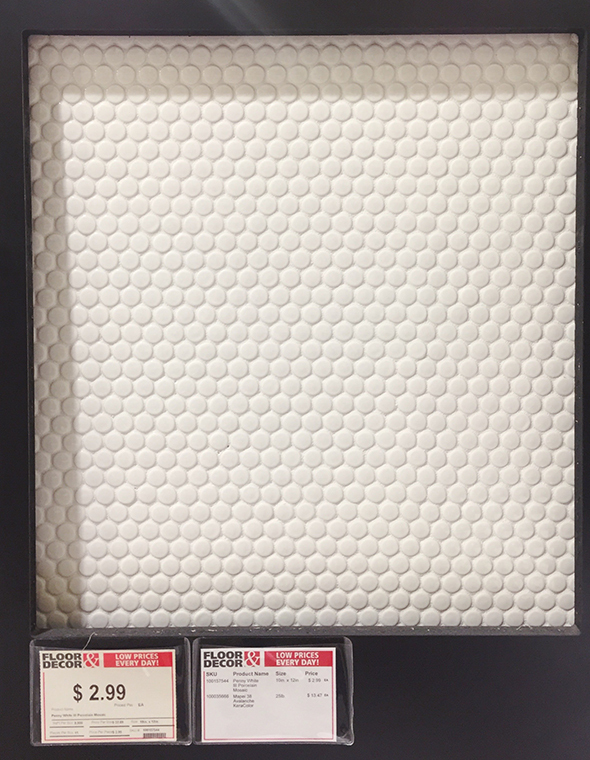 I just bought tile for a bathroom vanity wall, can’t wait to see it go up. 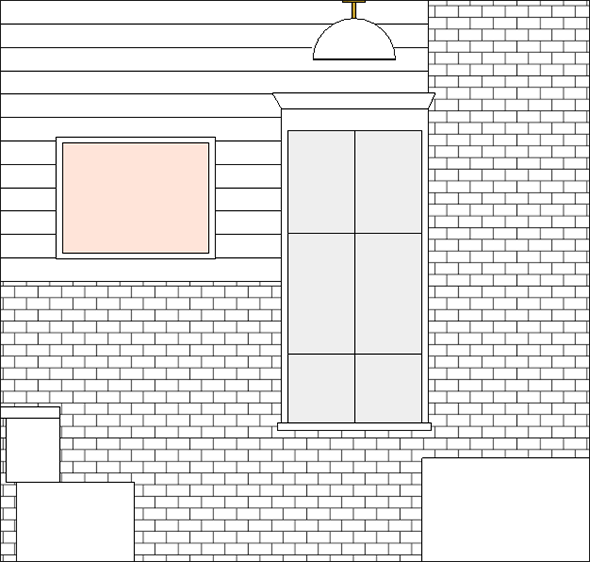 I was wondering if you do any kind of just consultations, aka, I am replacing all my exterior lights, putting in all new flooring (we currently have stained concrete, and I’m tired of it), new dining lighting, and painting for whole house. Just consult, not buying or hiring or managing. IF you do, could you shoot me an email? Thanks! 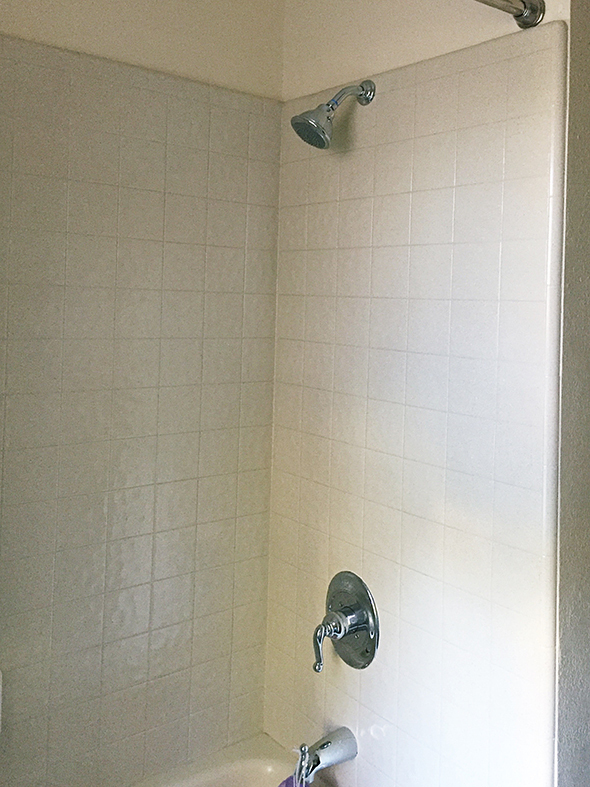 I have the exact same tile and tub in my bathroom, only I have a separate shower. My floor plan is almost the same too! I hate my tile. It’s gross, old, and I can’t get the shower grout clean. I just found your blog from YHL and can’t wait to see how your bath comes out. Hi Jenny! Love your post…it will all be gorgeous! Just to throw out some advice I received when planning a new bathroom. The round penny tiles can make the floor VERY slippery because they are usually shiny, but mostly because there is so little grout. Been following you for so long and love all you’ve done …. also love seeing “your” style evolve over time! My 2 cents: I chose matte penny round tile because Dwell magazine recommended it as a non-slippery surface in an ADA bathroom. I think the floors are “grippier” with all the little ridges. They aren’t slippery at all, but maybe glossy ones would be. Not meaning to disagree with you, Dara. I’m just adding in my 2 cents in case someone reading this is considering tile options. 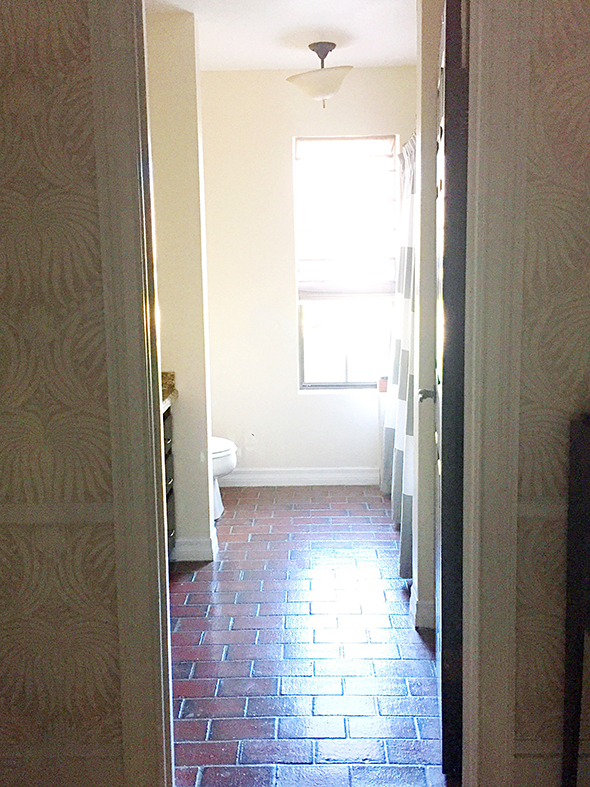 I love the paneling above the tile, can you share what type of board you use to do the paneling? 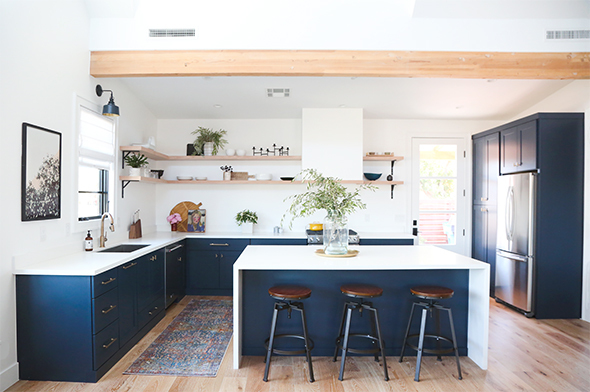 We are about to do the same thing in our kitchen because we have super high ceilings, but I am not sure what product to look for. Any tips you have for installing would be helpful as well! There are SO many options for shiplap. I usually use primed pine boards because I like a more defined line between the planks. Tongue and groove is a little more affordable and doesn’t require a dry wall backer, but I like the look less. We’ll be using melamine board in this bathroom because it is much thinner and will work with our space best. I did something similar in our mudroom if you want to search for the tutorial. Hope that helps! 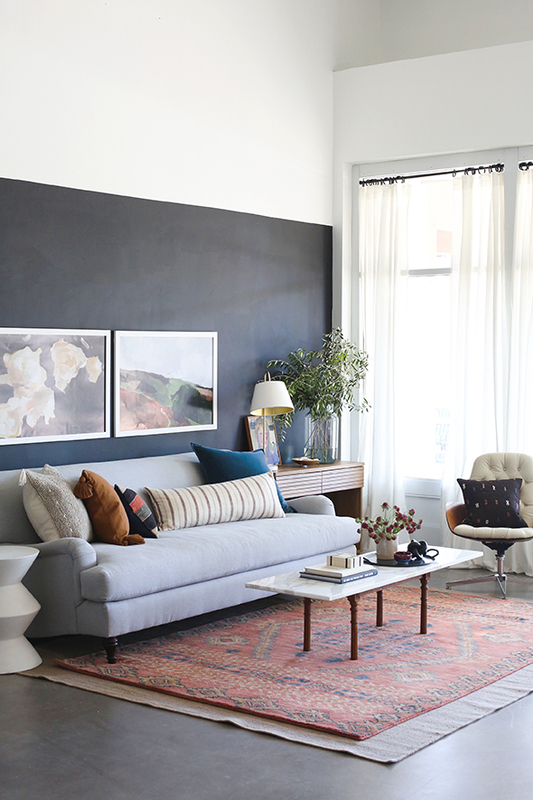 If you haven’t already picked lighting for this space, I would live to collaborate with you. Been a fan for a long time. Even managed to convince my husband to ceruse an old piece of oak furniture we had based on your post! I just stumbled across your blog and love your style! I live in Gilbert and it’s so great to see a fellow Arizona gal bringing some great design to the valley. When doing our guest bathroom I used the same herringbone tile from Floor & Decor and paired it with a faux marble from deck to ceiling, we couldn’t love it more! Can’t wait to see how it looks in your space! Hi Jenny! I was wondering what color grout youre going to pair with the herringbone tile on the floor? Thanks so much! I love this post. Getting to see all the various options and designs. I haven’t been thinking on some home improvement projects myself so this is very useful! good, These are all beautiful tiles! I know this was a couple years ago now but I love the layout of your bathroom! Do you happen to know the dimensions? Wondering if this would work for us. Thanks!